Happy New Year - hope everyone had a good holiday and looking forward to 2011. January for me means updating Rhubarb Festivals for one. I see dates being advertised already, as these events start early depending where you live in the world. One of reasons why people go to the United Kingdom is to experience participation in the Wakefield Festival of Food, Drink & Rhubarb Trade Fair. 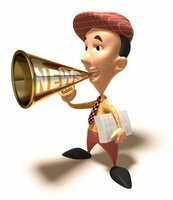 This Fair is also devoted to covering packaging, equipment, and new technologies, and runs from Feb. 25 - 26th this year. Vermillion South Dakota is already advertising their Rhubarb Day for June 5, 2011. This event features a rhubarb recipe contest, biggest leaf contest, speaker and apron display. You can have your photo taken with Rudy & Ruby Rhubarb too! Well, did you think you could ever have a brownie flavored with rhubarb? Here's a recipe combining rhubarb with chocolate and spices. Looks like it could have a bit of a kick to it with the spices. Over medium heat, bring rhubarb, water and sugar to a boil. Cook down until rhubarb is soft, and sugar is dissolved; approximately 10 minutes. Puree further if necessary and let cool. Melt the bittersweet and unsweetened chocolate in a double boiler, or a glass bowl in the microwave. Stir until smooth and set aside. Cream butter & sugar, beat until fluffy. Add eggs, vanilla and rum. Sift together flour, baking powder, chile powder, cinnamon and salt. Set aside. Stir rhubarb and chocolate together, add to sugar mix; combine well. Add flour mixture until just combined, do not over-mix. Fold in chocolate chips. Pour batter into 8 x 2 glass pan. Spray the pan or pour onto parchment paper. Speaking of different places in the world, I actually have a question for you people. This is a question (quoted) I recently read on a question and answer gardening forum. "When I was in Canada earlier this summer I got to eat some because my step-grand mother had grown some. It’s sooo good in strawberry rhubarb squares or strawberry rhubarb pie. But now I’m back in Texas and there is no rhubarb Most of the people I talk to here don’t even know what it is. I mean, I’m sure I could buy it SOMEWHERE in Texas but I just haven’t seen any around. And I’m sure it would be pricey if I ever did find some." Someone in Texas desperately wants some rhubarb! 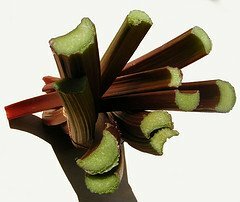 Now I understand it is indeed grown in Texas, and that the season starts in August, making the rhubarb sizeable in March and April. Did I misunderstand? 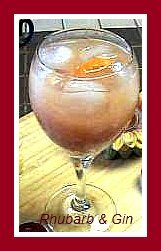 Looking for something a little lighter after all of the christmas heavy desserts? This recipe looks delicious! Combine 1-1/2 c cracker crumbs and butter. Press mixture into a greased 13 x 9 baking dish. Bake at 350º for 10 minutes or until lightly browned. Let cool. 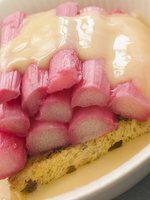 In a large saucepan, combine the sugar, cornstarch and rhubarb. 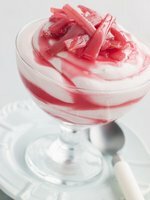 Bring to a boil; cook and stir for 2-3 minutes or until thickened and rhubarb is tender. Remove from the heat; stir in gelatin until dissolved. Cover and refrigerate for 1 hour or until partially set. Spoon rhubarb mixture over crust. Combine whipped topping and marshmallows; spread over rhubarb mixture. In a bowl, whisk milk and pudding mix for 2 minutes. Let stand for 2 minutes or until soft-set. Carefully spread over marshmallow topping. Sprinkle with remaining cracker crumbs. A natural lip balm is out now that tastes like homemade rhubarb pie. It is apparently great for chapped and dry lips and leaves a sheen like lip gloss. Like Rhubarb and Custard? Would you like it in the form of a "power" gel? Torq, a known Fitness Consultancy and maker of performance nutrition products (energy bars and drinks) have just added rhubarb and custard to their current list of flavors provided in their gels. These gels provide a boost of energy and are quite popular with fitness enthusiasts. Being based in the UK, this flavor was inevitable.